METEMPSYCHOSIS. FEW PEOPLE ARE FAMILIAR WITH the word. But everyone knows what it means. It’s the theory of the transmigration of the soul. When you die, your spirit, your soul continues to live. You pass on to another body, another world, another life. That’s the theory, anyway. 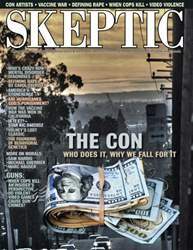 In 1791, however, a French philosopher and politician, Constantin-Francois Volney, made a daring claim: Metempsychosis is a myth born in the infancy of our species, a form of mind control used by governments and religions to make people believe there’s an invisible being watching their every move, judging them when they die. Volney published his heretical theory in a book titled The Ruins, or Mediations on the Revolutions of Empires, a kind of post-Enlightenment review of human history. In the first part of the book, Volney lays out a single general principle that predicts whether a nation will rise or fall. In the second part, Volney investigates the origin of world religions and concludes that humanity will achieve lasting peace only by adopting a complete separation of church and state. 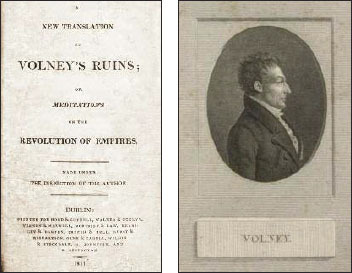 Volney’s Ruins: Title page and Frontispiece Portrait. Volney’s Ruins was an instant hit on both sides of the Atlantic, making its author either a hero or a villain, depending on the reader’s point of view. Among admirers of the book was Thomas Jefferson, who met Volney in Paris in the early days of the French Revolution. The two were introduced by Benjamin Franklin, the outbound U.S. ambassador to France whom Jefferson was there to replace. Jefferson saw the book’s general principle— empires rise if government allows enlightened self-interest to flourish—as a description of the Whig-inspired model of limited government he favored.